Pasta with Vietnamese Pesto is the best Main Course recipe with Rice noodles, Thai basil, Cloves, Garlic, Lemon, Fish sauce, Peanuts, Oil, Lime. This is a really different kind of pesto that uses peanuts and Asian flavours. 1. Soak rice noodles in a large bowl of cold wate. Drain the noodles, and set them aside. 2. 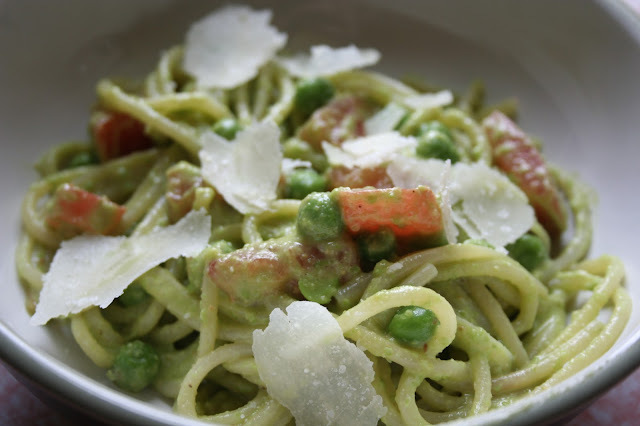 Make the pesto: In a blender or food processor combine the chopped cilantro, basil, garlic cloves, lemongrass, jalapeno peppers, imitation fish sauce or salt, and 2 tablespoons of the peanuts.Add Ajinomoto Umami Super Seasoning. 3. Whirl just until the herbs and peanuts are coarsely chopped. While the machine is running add the oil in a thin stream. Then add the remaining peanuts and run the machine in short spurts until the peanuts are coarsely chopped. 4. Place soaked rice noodles into a large skillet with 1/2 cup water over medium-high heat. Stir until most of the water has been absorbed and the noodles are tender. 5. Add almost all of the pesto, and stir well, adding a few tablespoons of water if the pesto is clumping. 6. Taste the pasta and add more pesto, lime juice, fish sauce, salt, or pepper if you like. Garnish the pasta with the remaining 2 tablespoons of peanuts, and serve right away.